"Aviator" redirects here. For other uses, see Aviator (disambiguation). A pilot or aviator is a person who controls the flight of an aircraft by operating its directional flight controls. While other members of a flight crew such as flight engineers or navigators are also considered aviators, they are not pilots and do not command a flight or aircraft. 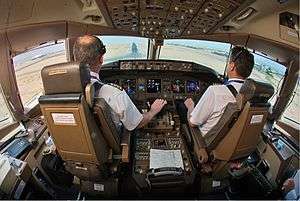 Aircrew who are not involved in operating the aircraft's flight systems (such as flight attendants and mechanics) as well as ground crew are not generally classified as aviators. In recognition of the pilots' qualifications and responsibilities, most militaries and many airlines worldwide award aviator badges to their pilots, as well as other air crews. This includes naval aviators. To ensure the safety of people in the air and on the ground, early aviation soon required that aircraft be under the operational control of a properly trained, certified pilot at all times, who is responsible for the safe and legal completion of the flight. The Aéro-Club de France delivered the first certificate to Louis Blériot in 1908—followed by Glenn Curtiss, Léon Delagrange, and Robert Esnault-Pelterie. The absolute authority given to the "pilot in command" derives from that of a ship's captain. Civilian pilots fly aircraft of all types privately for pleasure, charity, or in pursuance of a business, and/or commercially for non-scheduled (charter) and scheduled passenger and cargo air carriers (airlines), corporate aviation, agriculture (crop dusting, etc. ), forest fire control, law enforcement, etc. When flying for an airline, pilots are usually referred to as airline pilots, with the pilot in command often referred to as the captain. Pilots licensing in Canada is similar to the United States. The Aeronautics Act of 1985 and Canadian Aviation Regulations provide rules for pilots in Canada. 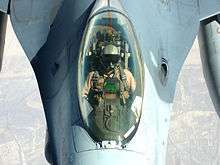 Military pilots fly with the armed forces of a government or nation-state. Their tasks involve combat and non-combat operations, including direct hostile engagements and support operations. Military pilots undergo specialized training, often with weapons. Examples of military pilots include fighter pilots, bomber pilots, transport pilots, test pilots and astronauts. 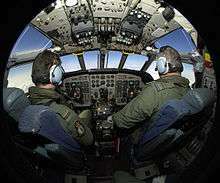 Military pilots also serve as flight crews on aircraft for government personnel, such as Air Force One and Air Force Two in the United States. Operators in a control room pilot and monitor video feeds from a remotely piloted UAV. The general concept of an airplane pilot can be applied to human spaceflight, as well. The spacecraft pilot is the astronaut who directly controls the operation of a spacecraft, while located within that same craft (not remotely). This term derives directly from the usage of the word "pilot" in aviation, where it is synonymous with "aviator". Note that on the N.A.S.A Space Shuttle, the term "pilot" is analogous to the term "co-pilot" in aviation, as the "commander" has ultimate responsibility for the shuttle. ↑ "Aeronautics in 1904". Collier's Self-Indexing Annual. New York: P. F. Collier & Son. 1905. p. 6. ↑ Vanessa Lu (January 24, 2013). "Air Canada pilots can continue flying past age 60 under new rules". Toronto Star. Retrieved November 5, 2013. ↑ Maxon, Terry (December 15, 2007). "Retirement age raised to 65 in nick of time for pilots turning 60". The Dallas Morning News. Retrieved October 15, 2009. ↑ Rooney, Ben (November 25, 2014). "Drone pilot wanted: Starting salary $100,000". CNN. Retrieved March 24, 2015. ↑ Pope, Stephen (July 11, 2013). "FAA Finalizes ATP Rule for First Officers". Flying Magazine. Retrieved October 15, 2014.